Using the Cafeteria Plan to Draft the Landlord's Assignment Clause, The Landlord's Bare Bones Assignment Clause, and the Lease Clause Critique: 7 Devices to Toughen Up the Landlord's Bare Bones Assignment Clause When the Market Permits. There's no doubt that a landlord with a weak bargaining position will have to settle for minimum protections on assignment and subleasing in its lease form. "Minimum protections" means an agreement by the tenant that lease transfers are subject to the approval of the landlord, and precious little else. Conversely, a landlord with strong leverage will be able to include a much more thorough assignment clause in its form lease. That more comprehensive clause would likely contain several other features expanding the landlord's control of lease transfers, such as a recapture clause, limitations on the tenant's ability to advertise the premises for sublease, and an excess rentals clause. There is a wide gap between these two extremes of bargaining power from a drafting and negotiating standpoint. The landlord wants the best assignment clause in its form lease that current bargaining power will allow. How does the landlord go about getting it? And how does the landlord modify its lease transfer provisions in response to fluctuating vacancy rates in the market over the years? One approach the landlord can take is a cafeteria plan analysis of the assignment clause in its lease form. This is how the process works. The landlord starts its analysis and drafting with a bare bones assignment clause which does little other than require the landlord's consent for lease transfers by the tenant. Next, the landlord compiles a list of other contractual devices that would expand its control of the assignment process. The landlord picks and chooses among those features--cafeteria style--and adds as many extra features to the clause in its lease form as the market permits. If the market tightens up in the future, the landlord can add more of those features to its current lease form. If the market gets softer, it can take a few out. The next section contains an example of a bare bones assignment clause that a landlord could use as a starting point for its drafting exercise. The Lease Clause Critique features seven separate contractual devices which can be added to the bare bones clause to expand landlord control of assignments and subleases. The landlord can pick through the selections, and decide what to put on its tray. The landlord can come away with a clause that matches its tastes perfectly, so long as it has the leverage to pay for it. Bon appetit! The following landlord assignment clause is a bare bones provision that makes lease transfers proposed by the tenant subject to the landlord's approval. It would be appropriate for a landlord with relatively little leverage, such as a landlord trying to lease space in a market with extremely high vacancy rates. 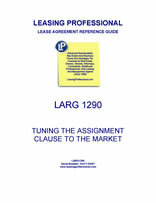 The clause is also a good starting point for a cafeteria plan analysis of a landlord's assignment clause. Any commercial landlord would greatly prefer a more comprehensive transfer clause--one using several of the devices included in the Lease Clause Critique--if the landlord has the required leverage. It is crucial for the landlord's lease to contain an assignment clause regulating lease transfers by the tenant. Otherwise, the tenant will be free to transfer the lease and the premises without landlord approval. The law favors the free transferability of leasehold estates, and restrictions against assignment and subletting usually are strictly construed by the courts. This means that pro-landlord clauses must be specific in their restrictions on lease transfers proposed by the tenant for the landlord to have substantial control over the transfer process.